Here you'll find free tips on tracking dog training, and a great history on human tracking and how bloodhound tracking was started. Let's start with a little history... bloodhounds were the first man trackers, used not for sport (like today), but out of necessity to stop raiders from pillaging towns and villages in Europe. Apparently, Henry VIII made use of Bloodhounds in the wars against the French, and Queen Elizabeth I used about 800 of these dogs during the Irish Rebellion. Later, Bloodhounds were kept on large estates to protect against livestock thieves and poachers. Run-away slaves in Jamaica and estates in America were tracked and hunted down by the Cuban Bloodhound. Because of the use of this specific breed, the public began to think of them as ferocious and aggressive. For quite a while, there was hardly any support for using these dogs in police work. In truth, the dogs enjoyed following the scent and tracking, and were very rarely aggressive. The breed is actually affectionate and very intelligent, but requires a very firm handler in training. Today, human tracking dog training is done for sport as well as work. According to Dogs in Canada, "hunting dogs track game by scent, search and rescue dogs track lost people, police dogs track bad guys, and some dogs just track toys for fun." In competitions, tracking dogs are tested for willingness to work, follow a specific scent and locate/indicate articles. Any breed can be used for tracking dog training, however, some are better at it than others as they were bred for that specific task. Examples would be hounds, German Shepherds, Belgian Sheepdogs, and Labrador Retrievers. OK, enough history for now. If you're reading this, you probably are interested in getting started with tracking. 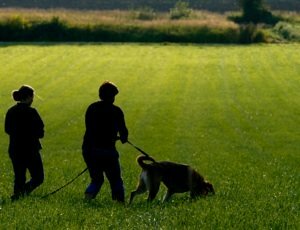 This will give you an overview of tracking dog training. First, of course, is your dog. Before any training can begin, you need to know whether or not your dog has the proper drives for it - hunt drive, play drive and retrieving instincts. The passing result will be for your dog to find his toy and/or bring it back to you. If the dog gives up after a minute or two, is disinterested, lays down or just stands there waiting for your help - he doesn't have the required drive. Another possibility for this response would be that the toy wasn't interesting enough to him. In that case, try it with another toy. This toy can be a kong, tennis ball, tug toy, squeak toy, water bottle, stick, or anything that really excites the dog. Why is this test important? It tells you if your dog has the necessary mental concentration needed for human tracking. Also, this toy becomes the reward for your dog (not food). If your dog passes the above test, the toy that is going to be used should be put away except for training. This keeps it a novelty, and not just a regular chew toy. Believe it or not, a tracking dog is really looking for "his toy" on a search. Next, you want to focus on socialization, obedience training and building drive. The dog's temperament needs to be stable, so get him used to new people, unusual terrain or flooring, smells, darkness, shadows and weather. Keep in mind - you don't want a dog that is overly submissive. 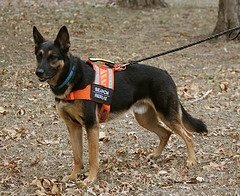 A harness usually works better than a collar, as it doesn't constrict the dogs throat at all when he is pulling. Make sure that your leash is strong - leather is the best - as your dog will be doing a lot of pulling. Obviously, this is not the time to be correcting your dog for pulling on the leash! Training a Bloodhound to track. loading the dog up - teasing the dog with the reward toy, not letting him get it, in order to build drive for the search. Initially, the track-layer will hold the toy, and load the dog up. While the handler stands in one spot, the track-layer runs away with the toy. When starting tracking dog training, only go around the corner. The handler gives a command ("Justice, search! ", or your choice of word) and encourage the dog to follow the helper. Do not lead the dog; let him pull you. As soon as the dog finds the helper, give him the toy and let him carry it around for a minute. Don't let him chew it up. Slowly, you should make the searches longer and more difficult. Remember to always load the dog up before searches. Eventually, the handler will hang onto the toy during a search, with it hidden in a back pocket. He will then toss the toy from behind in front of the dog for it to "magically appear" when the dog finds the helper. Don't try open searches until your dog is completely reliable off leash. And remember, this is just an overview - for complete tracking dog training, talk to a dog trainer in your area!